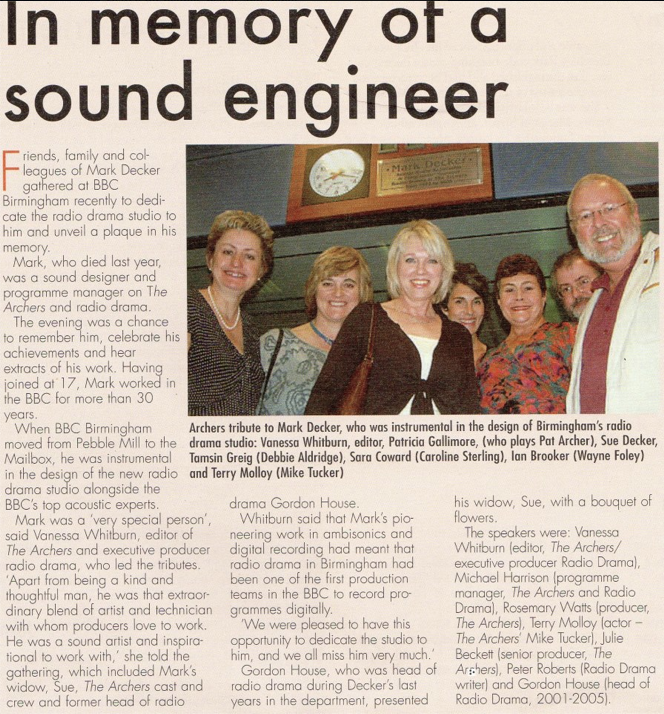 This article from the BBC retirees’ magazine, Prospero (November 2006), commemorates the dedicating of radio drama studio in the Mailbox, where The Archers is recorded, to the memory of sound designer, Mark Decker. I also worked with Mark Decker on radio drama and it was always a pleasure. He was a true pioneer and very humble. He used to teach our department about digital technology when the outside world were not even aware of its existence. He was kind and dedicated and loved his curries in Balsall Heath. I remember going with the whole cast of Zorba the Greek, a lot of the actors came from London and they loved it. It was a tradition with Mark to go for a curry and I have happy memories of that. I used to think the Decca tree was named after him, Decker tree. that would have been fitting for him. I’m fairly certain it was Marc, repeat Marc – probably a common mistake!